Currently Viewing Topic: What our concertinas look like? Melodeon, recorder, church organ, and... concertina ! Hi ! As I just posted on the FB "Concertina are cool" group, I was about to subscribe to the OAIM website when I saw your announcement. I'm a beginner from France (in an area where Irish sessions are very rare), have a decent Internet connection, and wish to learn a little more "by ear" as well as vary learning sources (for now I use excellent Gary Coover books exclusively). Your video system seems to me more "modern" compared to the OAIM one. What's more, I don't want to learn another Irish instrument. Conclusion : I see no reasons to not subscribe to your course instead of the OAIM one. 🙂 Advices are nevertheless very welcome ! Hoping to be your "student" soon ! Hi, As a beginner I can recommend the Gary Coover books. I find them very clear and of progressive difficulty. Very good news ! Can't wait to listen to this album too. Only my laptop with its integrated webcam and mics. Far from perfect, but someday I'll browse the C.net forum to find some video capture material :-) And for recording, I use an online utility (https://webcamera.io/fr/), and then edit a little and add fadings with OpenShot video editor (https://www.openshot.org/). Thanks ! I exclusively use for now the Gary Coover books. Yes for harmonic style there are many tunes with suggested or fingered chords. The Carol comes from the Christmas concertina book. The Eleanor Plunkett , coming from the Irish session tunes book, has also a harmonized version, but I don't play it good enough for now. Next time I hope ! I love this air. 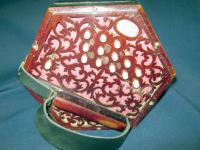 World War One Concertina : Another Possible Book ? Hi, Thinking about other tunes book which could be made with a "theme", I wonder if a "world war one tunes" could be of interest ? I listened to these songs and find them probably suited to a tune book : "It's a long way to Tipperary" (1912, popular since 1914 with United Kingdom expeditionary forces coming to Boulogne-sur-Mer in France) https://www.youtube.com/watch?v=XVM-tFAdADg "Waltzing Matilda" (1895, Australia) https://www.youtube.com/watch?v=CwvazMc5EfE "Danny Boy" (on Londonderry Air, irish tune) https://www.youtube.com/watch?v=0Lj8Zg_PiN4 "Keep the home fires burning" (Ivor Novello, 1914) https://www.youtube.com/watch?v=5P8UokgVqWs "Pack up your troubles on your old kit-bag" (1915) https://www.youtube.com/watch?v=kXcs1Vv3YlE "Over there" (1917, when US declared war) https://www.youtube.com/watch?v=B6hRDS3LvQQ "Farewell to Slavianka" (1912 for Balkanic wars, but popular during WW1 among russian soldiers) https://www.youtube.com/watch?v=FJt_JdFwLw0 "Der Gute Kamerad" (Ich hatt' einen Kameraden, 1809 but very popular among german troops) https://www.youtube.com/watch?v=CN-vN_zJvwE "Lili Marleen" (1938 but from the poem Lied eines jungen Wachtpostens from 1915) https://www.youtube.com/watch?v=wh4qe0Hp6RU "Quand Madelon" (1917) https://www.youtube.com/watch?v=vS2ML_0Ky0M "There's a long long trail" (1914) https://www.youtube.com/watch?v=9WdCCNXL6Uc "Roses of Picardy" (1916) https://www.youtube.com/watch?v=GZ87ICmR-2k "I didn't raise my boy to be a soldier" (1915, anti war song) https://www.youtube.com/watch?v=-C2qOAgMCl4 "It's time for every boy to be a soldier" (1917, lyrics from the same author of previous song !!) https://www.youtube.com/watch?v=RX3SuMQJQLY ..... There are surely more of popular songs to add ! See here this tracklist. Here is an interesting article of UCSB Cylinder archive. Another (french) source (National library recordings) Some other popular "tunes" of that time, such as from Debussy, Ravel or Holst are probably less suited to a tune book, I guess. What do you think of it ? Gary Coover, after the Cowboy concertina, perhaps ? Thanks for this site ! Great recordings, with a good sound quality. Why do they put videos with flash, however ?? Cowboy Concertina - New Book? Hi Gary, I have no "cowboy song" to submit, but I'm longing to buy this book when ready. Between gifts and personal boughts, I have now all of your anglo tutors. I find them very clear, "sober" (I mean without many "disturbing" pics or anecdotes). There are plenty of tunes ; I find them accurately chosen and sorted. Congratulations for this well-done work. So ! When this book will be ready, I would be glad to know it. Beginner Question : Vintage Or Cheap Hybrid ? Mike, I understand ; thanks for detailed explanation. I totally agree : I have to improve this, among many other things. By the way, I have difficulties to play on the left hand the middle finger for E/F (fourth button in Gary Coover tab system) at the same time with the ring finger for B/C (ninth button). Does anyone have some advice ? I guess it would help me to have handrests higher than the default ones ; I have quite long fingers. Didier Jaffrédo in his tutor tells one can adapt tubular pipe insulation material on handrests if I remember well. Hi Frank, Peter and Craftydab. Thanks for the advice. I'm now a happy owner of the Lachenal - Murdoch 26 button shown above (bought from Chris at Barleycorn). I know it would perhaps need some "repair" or so in next years whereas a "well-made" hybrid such as yours would not. But I am so confident now to have stuck with vintage instead of hybrid, because of the sound. I am playing a very good (tipo a mano reeds) Castagnari melodeon, and I am very very happy to start playing a "real concertina reeds" instrument in parallel. I know, even Wheastone used accordion reeds during the 20th century, and accordion reeds concertinas are not "low end" or "not real" concertinas. But I personnaly needed an instrument with different reeds for my ears and heart. Something very personal. And since last week when I started playing, the house and the family members find the sound I emit rather nice to hear :-) I'm personnaly loving the sound of this vintage concertina.